Custom Design Concrete Baleno Concrete LLC. Baleno Concrete LLC. can customize your project. Custom design by Baleno Concrete LLC. Hydronic radiant heating systems uses a boiler to heat a solution and with a pump circulates the solution in the plastic pipes installed in a concrete slab. The pipes, embedded in the driveway or basement, conducts warmth to the surface of the driveway or basement where it broadcasts energy. Separated radiant heat zones are controlled by one thermostat and served by a manifold which distributes the solution to the individual circuits of tubing within each zone. Steel decking (also called pan decking) has deep ribs to provide rigidity to support concrete during the pour. These ribs also strengthen the cured concrete. The steel panels, typically 3 ft. wide, must be spot-welded together. This ribbed profile with embossments designed to interlock with concrete slabs, creating a reinforced concrete slab that serves the dual purpose of permanent form and positive reinforcement. Using a variety of color combinations, designs, and different textures, We were able to incorporate concrete into nearly every element existing in the patio entrance to steps. The result? A one-of-a-kind retreat, exquisitely designed for outdoor enjoyment. The combination of inlays for your project are endless. Looking for a innovative accent, we can envision a unique design just for you. This border accents the backyard patio. Creating a unique outdoor space. Different stamped designs are available.. Width of border can vary to your desires. To add a creative dimension to any concrete project, we can add different geometric designs to make that "one of a kind" individual fantastic project. When you want a hardwearing surface that has a designer-edge, Exposed decorative aggregate concrete looks great today as it does tomorrow. 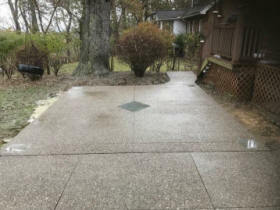 Driveways pool walks, public sidewalks, any concrete project, they're all areas where looks and performance are crucial. 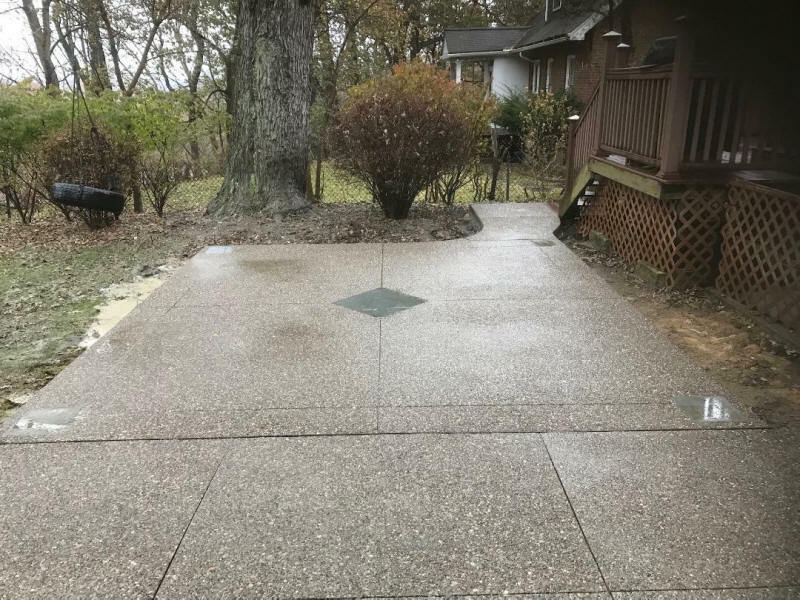 Exposed aggregate is a good looking alternative that performs lifetime-without a lifetime of maintenance. made from exposing some of the aggregates (sand and small stones) in the concrete, it looks very natural.. Artistic etching design that we can apply for a irreplaceable effect. 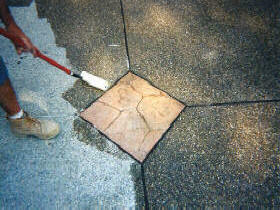 Stone etching can be applied vertically or horizontally. Recently, the Americans With Disabilities Act have made quite a few updates to rules and regulations concerning tactile ground surface indicators. Truncated dome pads are a specific color and texture which indicates changes in the ground surface level for those who are blind or visually disabled. They can be installed on wheelchair access ramps, sidewalks, train platforms, and on curb cutouts. They are not only useful for those who are blind but can also be used to increase safety for everyone. 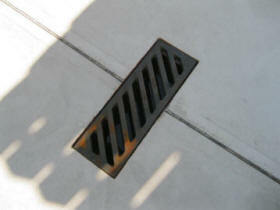 We use only heavy duty grates for all our drain covers. These grates are 3/4 " to 1" thick, extremely durable and long lasting. Baleno Concrete LLC is pleased to discuss any of your individual custom design requests. Please contact us for more details on how we can be of the best assistance for your concrete plans. To schedule your project TODAY! Baleno Concrete LLC has gone green.